The final 17 players will now play three more hands before bagging and tagging for the night. They will then return tomorrow at noon to play down to a winner. We are now down to the final 25 players in Event #1 and there are still two ladies standing in the field. 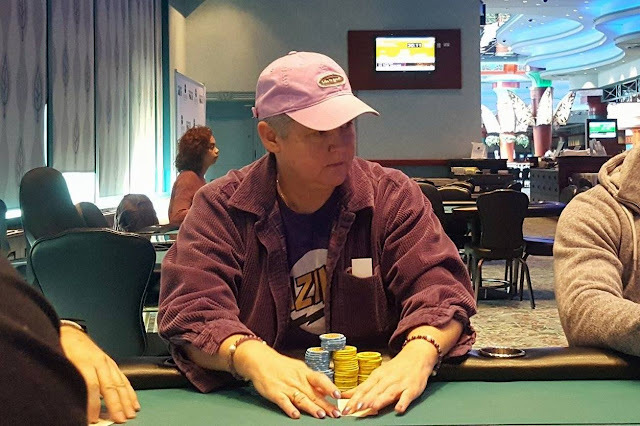 Linda Swears is a Foxwoods regular has had a lot of success in tournament poker. Her most recent win came when she took down the Ladies Event here at Foxwoods in May of this year. Laurie Hilton is a also a Foxwoods regular. 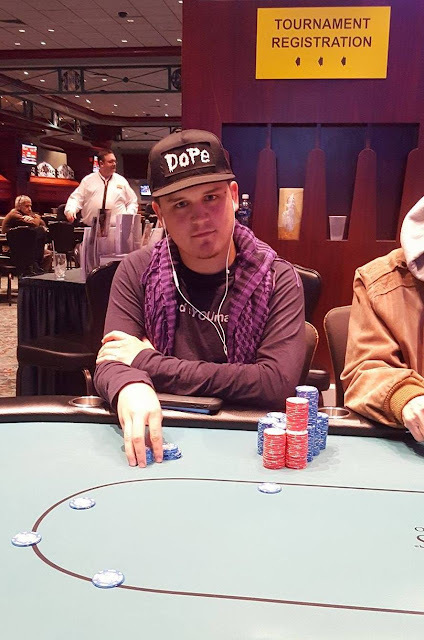 Hilton is a regular cash game player who has recently started playing more tournaments and has had a few deep runs over the course of the last year. 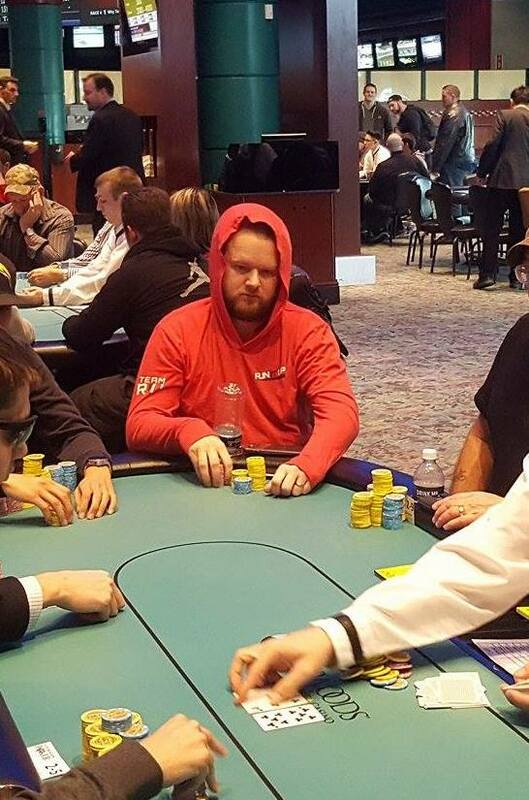 Hilton is currently sitting in the five seat on the feature table streaming live at the link located at the top of this post. There's around 300,000 in the middle and a board reading K♠8♠5♦K♣6♣ when Stephen Lapoint shoves all in for 238,000 from under the gun. Leonard Sande III goes deep into the tank in the hijack. 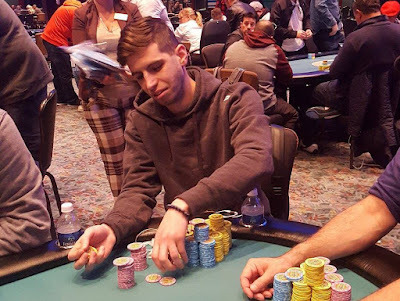 Sande places a chip on top of his cards, leans back into his chair, and thinks for over four minutes before moving a stack of chips forward to call. Lapoint quickly turns over 9♠7♠ having flopped a flush draw and rivered a straight. Sande III mucks his cards without showing. The remaining 37 players are now on a 60 minute dinner break. They will return to play Level 23 with 8,000/16,000 blinds and a 2,000 ante. JeWook Oh was recently eliminated from play after he got it all in with two pair holding Ace-King on an Ace-King-Queen board. His opponent, Leonard Sande III called him holding Ace-Jack, and then spiked a ten on the turn to hit Broadway. Oh was unable to improve on the river and was eliminated from play. The remaining 55 players in Event #1 are now on their second break of the day. They will return to play Level 21 with 5,000/10,000 blinds and a 1,000 ante. The average chip stack upon the players return will be 421,090. The board reads J♣9♣3♦ when Darrell Blodgett gets all of his chips into the middle and gets snap called by Solomon Yi. Blodgett is holding K♣K♠ for an over pair to the board. Yi holds Q♥J♠ for a pair of jacks. The Q♣ turn gives Yi two pair to take the lead. But the 3♠ that hits on the river gives Blodgett the pot with a higher two pair, and he is awarded a full double up. Here is a look at the second round of eliminations. All of these players are taking home $1,260 for their finishes. Sean Carlson shoved all in holding ace-jack and was called by Nick Palma holding Ace-King. The board ran out 7-high to eliminate Carlson from play. Foxwoods regular Frankie Flowers is well known on the poker scene. He has a very impressive poker resume, peppered with deep tournament runs. In addition to tournament play, he can also be found regularly playing cash games on the regular. But Flowers life extends far beyond the felt. He has been involved with charity work and bettering other people's lives for many years. 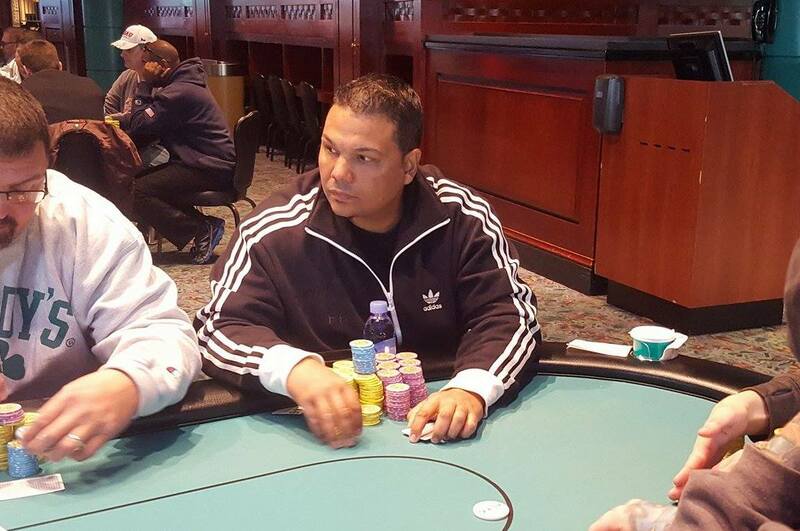 This morning Frankie started out as one of the top 20 stacks of the returning 140 players. He is now sitting with just under 700,000, good for one of the top two stacks of the remaining 78. Frankie took a few minutes on his break to tell the foxwoodspoker.com staff that he is playing for a lot more than just himself in this tournament. Flowers has committed a percentage of any of his winnings to his late father's charity, John Flowers Events. Any money won/donated will go to supply 65 families in the New York area with Christmas gifts/supplies. It will also be donated to 26+ nursing homes and hospitals in New York. Flowers has a lot of people watching his deep run in this tournament very closely as he is playing not only for himself, but for the greater good of many individuals and families in need this holiday season. The remaining 89 players are now on their first 15 minute break of the day. They will return to play Level 19 with 3,000/6,000 blinds and a 1,000 ante. Vito Masi shoves all in from early position for 73,500. It folds around to Soukha Kachittavong on the button who shoves all in for around the same chip stack, and both blinds fold. The K♥K♣2♥ flop is safe for Kachittavong, but the 6♣ turn gives Masi a flush draw. Unfortunately for Kachittavong, the 9♣ river brings in the flush for Masi, and after a close count of chips, Kachittavong is eliminated from play in 101st place, taking home $1,260. There's over 100,000 in the middle and a board reading 6♥5♦2♠K♦A♠. Oleg Vayman announces that he is all in, and Adam Goldberg quickly calls. Vayman turns over A♦5♣ for two pair, and Goldberg mucks his cards face down. After a very close count of chips it's determined that Vayman has Goldberg covered, and Goldberg is eliminated from play. Here is a look at the first round of eliminations. All of these players are taking home $1,200 for their finishes. According to Joseph Chividian, he recently won a . 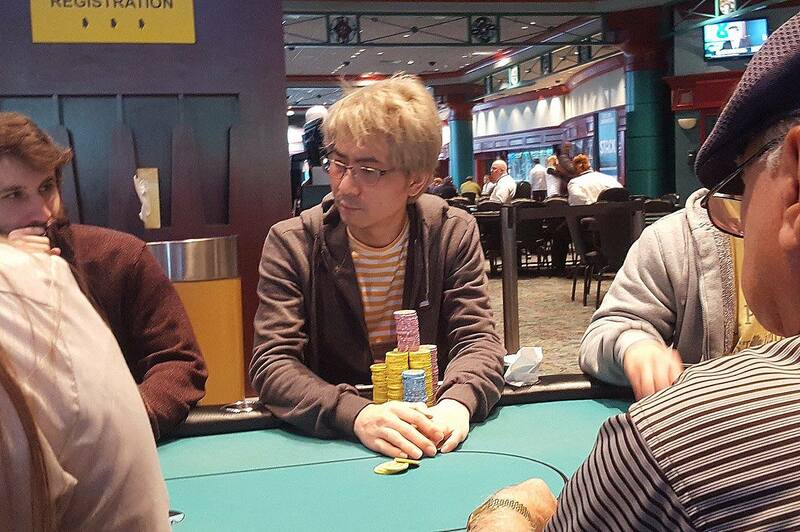 A player in middle position raised to 8,000, the cutoff called, and Chividian reraised to 19,000 in the big blind. The original raiser folded, and the cutoff called saying, "I am going to have to smash this flop to win against you." The flop came J♣8♥3♠. Chividian bet 19,000, and the cutoff called. Both players checked the 8♠ turn. 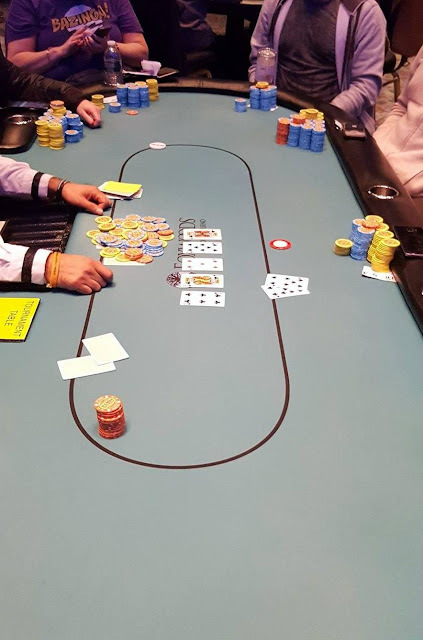 The river was the 2♦ and this time Chividian bet 32,000. The cutoff called and showed A♠J♥ for two pair, jacks and eights. But Chividian took the pot with his higher two pair holding A♦A♠ for aces and eights. According to Linda Swears, she just found an early day double up. It folded to Michael Woods in the small blind who raised. Swears looked down at ace-king and re-raised. Woods shoved all in, and Swears snap-called. It was a classic race with Swears holding ace-king against Woods' pocket tens. Fortunately for Swears she flopped an ace, and held to double up to just under 200,000 to start off the day. The General shoves all in from under the gun for around 40,000. John Sass calls in middle position, and Mark Walsh shoves all in for slightly less than 40,000 from the cutoff. The button and and blinds both fold and the players table their cards. The flop comes 8♥8♣2♠ leaving Walsh in the lead with his pair of jacks. He maintains that lead when the turn comes the 6♣, but the 9♦ on the river gives Sass a full house, and both the General and Walsh are eliminated from play early in the day. 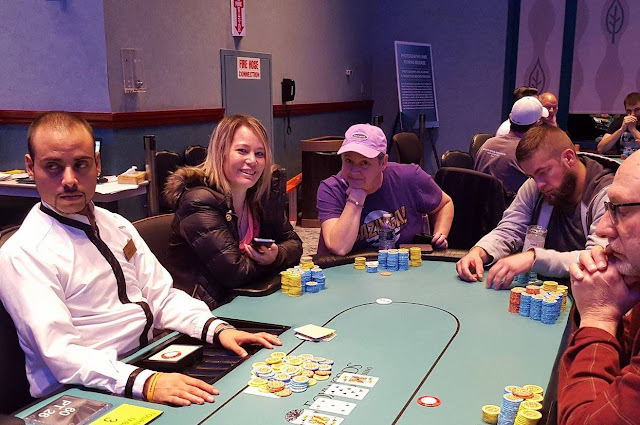 While 58 players moved forward to Day 2 in the money from Flight D of the $600 No-Limit Hold'em Re-Entry event, one one of them had already bagged in a previous flight. 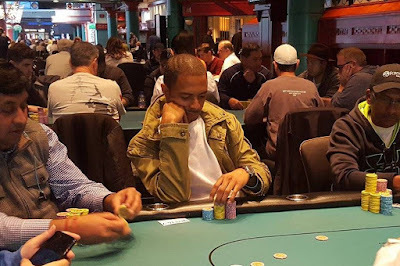 Solomon Yi bagged 169,000 in tonight's Flight D, but had previously bagged 36,000 in Flight C. Yi will be paid $1,200 for his smaller stack, and will carry forward only the 169,000 larger stack into Day 2 tomorrow. Given Yi's double bag, 140 total players will gather to play Day 2 tomorrow (Tuesday) at noon.